Stuffed Ravioli: Our giant ravioli covered in a delectable 3 cheese sauce or optional lobster bisque. Smothered Chicken: Sautéed chicken breast with thick cut smoked bacon, onions and cheddar cheese. Herb Roasted Turkey Breast: Slow roasted turkey breast in a dijon wine reduction. Chicken Penne Alfredo: Penne pasta with garlic alfredo sauce and chicken breast. Chicken Strips & Gravy: Tender strips of chicken with a side of light gravy with fresh mushrooms. Pork Cacciatore: Tender pork loin sautéed with onions, mushrooms, peppers and garlic in a tomato basil sauce. Lightly topped with fresh mozzarella. Pasta Primavera: Cheese tortellini, broccoli, cauliflower, carrots, zucchini, and yellow squash in a pesto cream sauce. Chicken Cordon Bleu: Seasoned chicken breast, rolled with ham and provolone cheese, garnished with a creamy hollandaise sauce. Bacon Wrapped Pork Filet: A delicious pork filet wrapped in bacon, grilled to perfection. 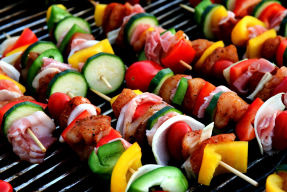 Grilled Kebabs: Choice of marinated pork or Chicken Kabab grilled to perfection. Mushroom Asiago Chicken: Chunked chicken baked in a creamy wine and asiago sauce with sliced mushrooms. Avocado Salsa Chicken: Chicken breasts with Avocado and salsa covered in Monterey Jack Cheese. Garnished with Jalapeno Slices to spice it up! Chicken Scaloppine: Dredged chicken breast with white wine, kapers. butter, and lemon. Recommended to be served over buttery pasta with asparagus. Cranberry Coq au Vin: Heavy glazed chicken thighs smothered with brown sugar, cinnamon and cranberries. Recommended to be served with red skin mashed potatoes. Honey Kissed Pretzel Crusted Pork Chop: Brushed with a spicy honey-mustard mixture, pork is coated with crushed pretzels, roasted, then served with a drizzle of seasoned butter sauce. Honey Glazed Ham : Choice butcher ham with our special glaze. Swiss Steak: Cube steak with sauteed mushrooms, onions and peppers in a homemade brown gravy. Lasagna : Layers of pasta, ricotta and parmesan cheese, seasoned ground beef, Italian sausage, marinara sauce and mozzarella cheese. Roasted Vegetable Lasagna : Fresh grilled garden vegetables within layers of pasta with classic ricotta and mozzarella cheese. Beef Burgundy Tips : Round steak tips simmered in beef broth and red wine, served with fresh mushrooms and onions on a bed of fettuccini noodles. Whiskey Peppercorn Flank Steak : Marinated and grilled flank steak, topped with our own whiskey peppercorn sauce. Hawaiian Chicken -Breast strips in a sweet Hawaiian demi glaze with onion, red pepper, and pineapple. Served with steamed white rice IPO rolls.